If you are looking for some inspiring moss arrangements, check out the blog of Raleigh-based Moss & Stone Gardens. In the effort of maximizing moss health, Helen suggests only lidding a moss arrangement for short periods of time. I echo this suggestion and you can learn why in the post Are moss terrariums ridiculously easy to care for? Hi! I have subscribed for quite some time and it seems like moss is easy to keep in terrariums. I lid mine, have diffused light and still my mosses turn brown after a while. They are not dried out, but they just don't stay lush and green. The ones I keep in total darkness until I put them in a terrarium seem to do great. I just can't see them! My selaginella starts to turn brown, too. It doesn't seem like there is too much moisture, but if you have some advice, I could use it. Thanks! I love your blog. Everything looks so amazing. That sounds like a tough problem! 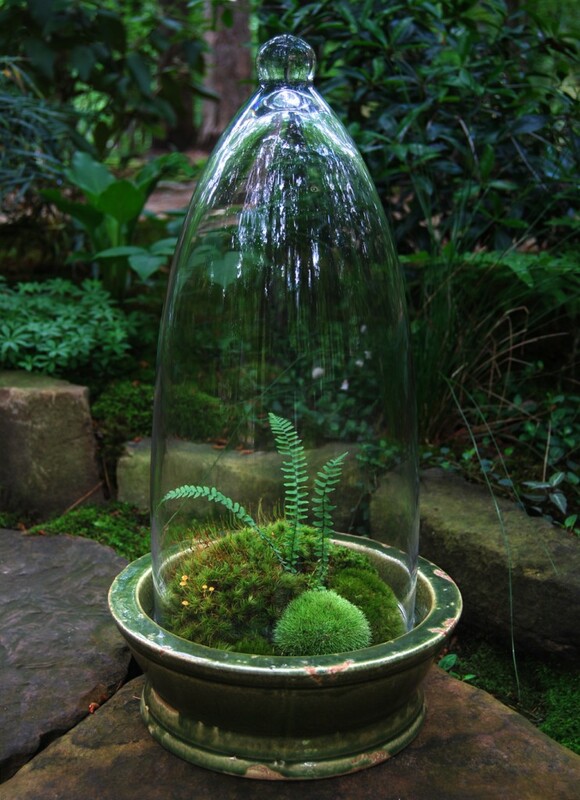 When moss is in a terrarium for a long time it has a tendency to loose the vibrant green you see in outdoor moss. In the terrariums I have successfully kept "happy" for a year or more the moss tends to turn a muted green or brown.